For all the global concern about Ebola, a more preventable disease outbreak – one that has racked up double the Ebola death toll – has gone by virtually unnoticed for the past four years, even though one of the world’s poorest countries has been its victim. Moreover, the cholera outbreak in Haiti was caused by the United Nations, which routinely likes to portray itself as a moral arbiter in world affairs. New Zealand has been one of the UN’s biggest fans ever since the organization was founded in 1945. So much so that the Clark government treated the existence of a direct UN resolution as a bottom line requirement for any committal of New Zealand troops overseas. By using the UN’s position as a moral and political benchmark, Clark minimized the risk to New Zealanders from retaliatory action by terrorists while – at the same time – doing no harm to her subsequent job prospects at the UN, either. For these and other reasons, we should be concerned about the UN’s scandalous behavior in Haiti. 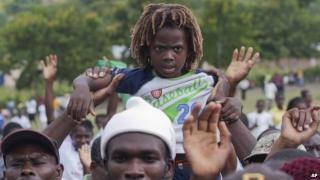 After the disastrous 2008 earthquake in Haiti, the UN arrived to help. Unfortunately for Haiti, the UN helpers included a contingent of troops from Nepal, and sewage from their encampment quickly fouled a major river system. 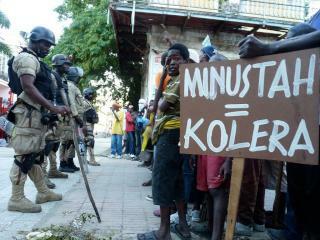 The result has been a cholera epidemic that has killed 8,500 Haitians over the past four years. About 300 people a week are still being diagnosed with the disease, which has spread to neighbouring countries. To date, the UN has refused (a) to accept responsibility for the outbreak (b)_to pay reparations, or (c) even to apologise to Haiti, and to the people it has infected. Furthermore, when several class action suits have sought to make the UN liable for compensation, the UN has either denied the claims or invoked immunity – presumably because accepting responsibility might affect its operations elsewhere in the world. To put this in context, no one in Haiti had died of cholera in the preceding 100 years. The particular strain of cholera now evident in Haiti is a South Asian variety common in Nepal and an outbreak had occurred in Nepal shortly before the deployment. No one thought to screen the Nepalese adequately. The Nepalese troops were camped upstream on a tributary of the Artibonite River. Teams of epidemiologists that have investigated the cause of the epidemic – – including those from of an independent panel set up by the UN itself – have concluded that the Nepalese peacekeepers were the ‘most likely’ cause of the outbreak. See a very good graphic (by the New York Times) of the cause and course of the cholera epidemic here and also this academic paper here. A slide show on the current state of the epidemic explains why – although the incidence rate/fatalities are declining as in the normal course of any epidemic, the extent of outside help is also declining, and the death rate among the infected patients is actually rising. The UN remains intransigent about refusing to accept blame, even though – under Section 29 of the UN Convention on the Privileges and Immunities of the United Nations – there is an onus on the UN to make provisions to resolve disputes involving the UN, in those cases where the Secretary-General has not waived immunity. 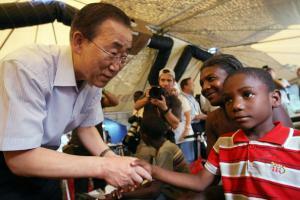 During a two-day trip to Haiti in July, FRANCE 24 challenged the secretary-general several times. Stressing that he was in the country “to bring a sense of hope and support,” Ban refused to answer questions concerning any potential apology or compensation to families of victims. The UN’s responsibility for the epidemic rests on two planks : (a) that it failed to adequately health check the Nepalese for cholera, even though there had been that recent outbreak in their homeland and (b) that the UN failed to adequately monitor the sewage disposal methods of Sanco, the contractor whose activities resulted in the infected sewage leaching into the water system. Even so, the UN has since refused to cut its ties to Sanco. After the cholera outbreak and the revelations that followed, the US Department of Defense stopped working with Sanco. The United Nations, however, chose not to cut ties with the company. Instead, the UN has awarded Sanco millions of dollars’ worth of contracts over the past four years, including the construction of medical buildings which are undoubtedly used… to treat cholera patients. At the glacial pace at which this issue has been moving, the question of justice and reparations for Haiti will still be on the agenda if and when Helen Clark gets the top job at the UN. Presumably, she will be asked to make her position on this scandal clear, before Ban Ki-Moon’s successor is named.